Decades ago, when I was at art college, some one gave me a birthday present of two books on modern art, this one and What is modern painting? by Alfred Barr Jr (the first director of MoMA). For some reason I kept them both and over the years occasionally looked through them. This one by Rathburn and Hayes is a simple, straight forward explanation of art, basically using pictures and short pieces of text and its always an enjoyable read. I liked the way the authors combined Art and popular art to reveal an essential aspect of the medium. Ernst Haas (1921--1986) is a world renown photographer and any book dealing with the history of the medium will have his name in the Index and maybe a photo or two, probably color as this was his passion. I recently found this 1975 book remarkably cheap from an on-line seller. It turns out though to be rather disappointing probably because the book's theme is too broad to be summed up with one hundred and five photos. There's a bit of everything here: Grand Canyon; Amish country; native Americans; the mid-west; football; Disneyland; suburbia; skyscrapers; Civil War and more. Fortunately the book is not quite as bland as those photo books sold to tourists at airports and full of bright, glossy color pictures of the Nation. There are some great photos in the book but not enough of them to say these were obviously taken by Haas. It does include his famous 1969 black sky shot of Route 66 going through Albuquerque but nothing from his photo essay of New York that Life magazine ran over two issues in September 1953, some of these are now classic images. The book's layout is rather disappointing too. Whole page bleed photos are mixed in with others half a page with big blocks of empty page space either side. The white paper comes across as prominent as the photos. The back of the book has sixteen pages of comprehensive captions written by Haas. Danish photographer Joakim Eskildsen was commissioned by Time in 2011 to photograph American poverty and there's a lot of it according the US Census Bureau, their figures (always in flux) come out at fifty million. It's worth saying that this is American poverty, where people can have jobs and homes but they are living on the edge all the time in high crime areas, in debt, poor physical health, with no real disposable income after paying bills for day to day living. The fifty-two color photos capture all this in what the Census Bureau considers (in 2011) the most deprived areas in the country: Fresno, California; Athens, Georgia; Cheyenne River, South Dakota; New Orleans and Plaquemines Parish, Lousiana; Bronx, New York. The majority of photos have people in them in their living environment, which could be a room in house, a trailer, a tent or in the open under a bridge. I don't know if it was Eskildsen's intention but overall the photos have rather sombre color feel to them that contrasts with the always bright and sunny world of the American Dream that is out of reach to the folks in the pictures. The book is more than just a collection of photos though because each picture has an extensive caption (all these unfortunately are at the back of the book so a lot of page flipping is required) that names the person, their recent circumstances and their hopes for the future. In so many instances this really does seem bleak, despite living in the US. This isn't one of those huge photo books (only 9.5 by 8 inches) but the contents brilliantly capture the subject. 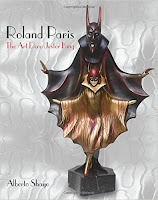 A lavishly illustrated book of an unusual artist from the Art Deco period. Roland Paris (1894-1945) doesn't easily fit into the conventional Deco artist genre. He worked in a range of media, oil painting, woodcuts, porcelain, bronze and prints. This separates him from most other artists who concentrates one media and become well known for it, for example: Cassandre for posters; Mauboussin and Fouquet for jewellery, Lalique for glass or Chiparus for statuettes. Shayo says in his Preface that Paris's work is not always elegant or graceful and frequently becomes a caricature of the subject. The book's title refers to the jester king and there are pages of paintings and statues of jesters with smiling (or should that be cunning) faces. A distinctive aspect of all the statuettes created by Paris is their lack of detail. He used bronze and ivory like other artists of the Deco period but doesn't take advantage of the precision that bronze offers, when cast, to fill even the tiniest shape, though all the ivory faces and hands are quite detailed as they were created in a foundrie's ivory-carving workshop. The texture of his bronze statues looks very similar to the porcelain ones, a medium that can't easily capture detail. The book has a remarkable selection of work (with 472 in color) predominately statuettes but also postcards, watercolours, sketches, prints, woodcuts, masks, lamps (statues on the base of a table lamp) magazine illustrations and oil paintings. The book's first sixty-five pages with the author's illustrated essay also has examples of a cartoon strip, illustrations of trolls for an exhibition, title page and roughs of a character to be used in a book of poems written by Paris. This essay also has photos of Paris and his family. The Bibliography doesn't list any other book specifically about Roland Paris so this one by the author should be accepted as the standard work on this intriguing Art Deco artist.